Due to regulations all charters are date and area sensitive. In particular, any charter including Halibut will need to be booked early. The Halibut Season, out of Westport, is short and customers book as much as a year in advance. Therefore, we recommend that you book early. The season begins the first Sunday in May and goes Sunday/Tuesday to quota. 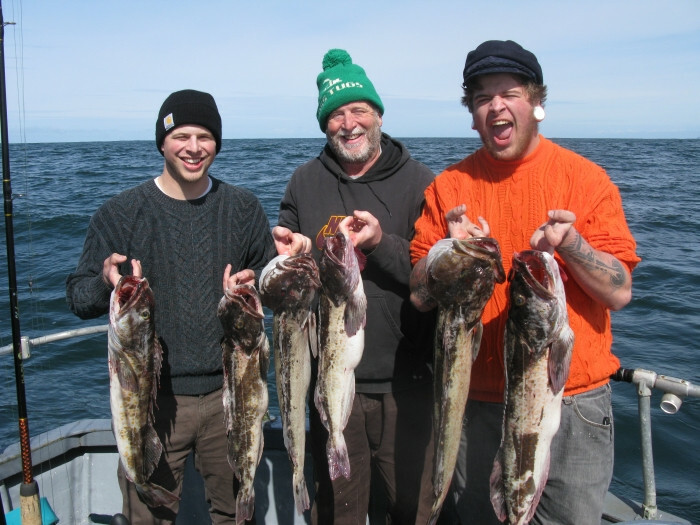 Halibut trips include, some time, fishing for Lingcod and Rockfish, weather permitting. The time spent fishing for Lingcod and Rockfish varies depending on how long it takes to catch the Halibut. The bag limit for Halibut is one/person. A variety of techniques and baits are used throughout the day. This trip lasts up to 12 hours. Bottom Fish season goes seven days a week from Mid March to Mid September. The trip includes Rockfish and Lingcod. The bag limit is ten Rockfish and two Lingcod/Person. A combination of live and frozen bait, will be used while either drift fishing or fishing at anchor. Jigs (artificial lures) are also used to catch fish. The day is eight hours unless the limit is caught in less time. A 20% DISCOUNT APPLIES TO THE SPRING BOTTOM FISH SEASON WHICH RUNS THE MONTH OF APRIL. Salmon season begins around the first of June and goes to mid September. The trip includes Salmon only. Incidental catch may be kept, regulations permitting. The bag limit is two Salmon/person. Regulations vary with regard to retention of Kings and Coho, during the season. Please call for details. Fresh/Frozen bait and a combination of trolling and mooching are used to catch Salmon. The day is eight hours long unless limits are caught in less time. This season begins around the first of June and goes to Mid September. This trip includes Salmon and Rochfish only. Incidental catch may be kept, regulations permitting. Regulations vary with regard to retention of Kings and Coho, during the season. Please call for details. The bag limit is two Salmon and ten Rockfish. Various techniques and baits are used throughout the day. The day is ten hours long unless limits are caught in less time. This season begins around the first of June and goes to Mid September. As indicated this trip includes Salmon, Rockfish, and Lingcod. The bag limit is two Salmon, ten Rockfish, and two Lingcod. Regulations vary with regard to retention of Kings and Coho, during the season. Please call for details. Various techniques and baits are used throughout the day. The day can last up to twelve hours. * Fishing License can be purchased locally. Deposits on trips canceled two weeks or more, prior to the charter date, will be refunded minus a 5% re-booking fee. Deposits on trips canceled with less than two weeks notice, prior to the charter date, will not be refunded. We Work Hard To Make Your Day Special. Thanks for the great time, I will make sure I would out and pump some iron, so I won't have such a hard time with those deep halibut...it was a pleasure fishing with you and your son. I'm not sure if you remember me (Vinnie from Gig Harbor) and the group I was with, we were on you boat last week on the 12th and 13th of May. Thanks for the awesome two days of fishing! Just wanted to thank you Tommy for a wonderful experience halibut fishing. I've recommended you to lots of folks already. I especially want to thank you for the way you guys treated Pablo who speaks little English.